If you’ve decided that now is the time to do some financial planning and you don’t want to meet with a planner, you have some choices. Up until recently, your only options were to either build your own spreadsheet or cobble together the results from a bunch of disparate online calculators. Fortunately, we recently introduced the first free comprehensive financial planning app that goes beyond the capability of your spreadsheets, an online calculator, and even a financial planner — and does so in an easy-to-use and delightful fashion. 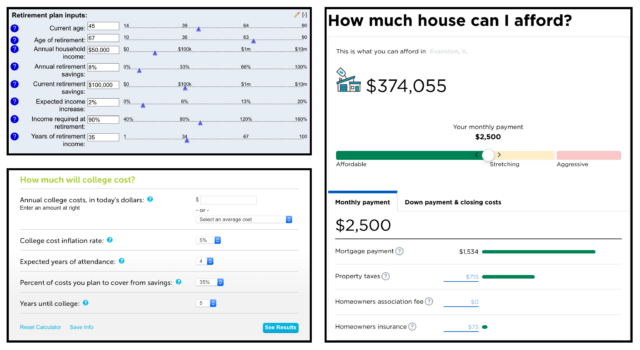 In this post, we will compare the main features of using Wealthfront’s free financial planning service with online personal finance calculators, and show you why the former can better serve your needs. The first challenge you face with an online calculator is the need to enter your financial data. It doesn’t matter if you’re trying to determine if you have enough money to retire early or how much home you can afford to buy, you always need to first input your spending and savings data. But if you’re like most people, you may not even know how much you actually save. 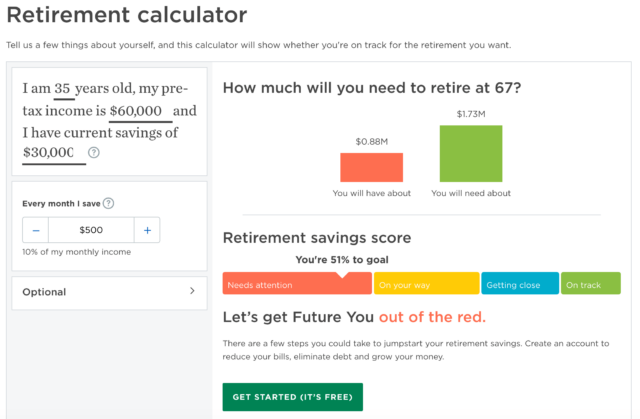 For example, while this retirement calculator gives you a visual representation of whether you are on track for retirement, you still have to manually enter your pre-tax income and current savings. It may take you quite some time and effort to get the right numbers, and your estimate may not even be accurate, which I’ll elaborate more on later. Interface of a retirement calculator on Nerdwallet. However, with our financial planning app, all you do is electronically link your accounts (banking, mortgage, investments, and more). Then we automatically determine your savings and your projected net worth at retirement. We even tell you at what age you can retire. With an online calculator, you need to set certain assumptions on your own. What is the expected rate of inflation? At what rate will your current investments compound? How much money will you be able to borrow given your financial situation? What’s the likely cost of a college education in 2030? Your analysis is only as good as your assumptions, and most people never get past this stage because they don’t know what to choose. In Wealthfront’s case our research team has chosen the assumptions for you based on relevant third-party data. Every day more data becomes available, which makes our assumptions even more accurate. We also make our assumptions easily available to edit so you can see how the results are affected by how conservative the assumptions are. Online calculators are typically dedicated to one task like retirement, determining the cost of college, or purchasing a home. If you want to evaluate several goals at the same time — for example seeing the impact of saving more for college on your retirement — then you need to manually create a spreadsheet that tracks the different scenarios. Three separate online calculators for retiring (Bankrate), saving for college (CollegeBoard), and buying a home (Nerdwallet). It gets even more complicated if you want to see the sensitivity of different assumptions. This makes it impractical to have a comprehensive and clear understanding of your financial plans and the subsequent trade-offs, and one of the main reasons why we built the free Wealthfront planning app. Move your slider to save more for retirement and you immediately see the impact on your ability to afford a new home. Calculators are static programs. They only update when you input new numbers — which is a snapshot of your finances in any given moment in time. In contrast, our financial planning app is connected to your real financial accounts and up-to-date data sources, so it changes whenever your finances or third-party data changes. You get a raise? It’s immediately incorporated into your plan with no effort on your part. The price of homes in your dream neighborhood suddenly rise? Your home affordability advice will change. That’s the beauty of a data based application. Research consistently shows that decisions based on accurate data consistently outperform the advice of experts. Unfortunately, many online calculators want you to believe they are data-based. But the only data they use is the data you supply. Thanks to technology, financial planning has never been easier. As the new year unfolds, we highly recommend that you use Wealthfront to gain a clear, accurate, and comprehensive grasp of your financial status, as well as your future goals. You can start building your financial plan online, or by downloading Wealthfront for free via the App Store or Google Play.